I know we are not technically in Autumn yet, but I’m definitely feeling a change in the air. The mornings and evenings are starting to feel a lot cooler and I like it! Autumn is my season, I love everything about it, well, maybe not the very rainy days. But everything else, the colours the weather and the food. I have already started thinking of warming, comfort foods and this mushroom curry with spinach and chickpeas is top of my list. There really is nothing like a steaming hot bowl of mushroom curry to warm the cockles. As you may have seen in some of my other posts we’ve been eating less and less meat. I wouldn’t go as far to say we are vegetarian, we are still eating some fish, but we have cut down our meat intake drastically over the last month or so. And it’s not been that hard to be honest, well once you make meals that taste good I think that is half the battle. All our meat-free meals have been tasty and mostly healthy so I’ve had no objections yet! 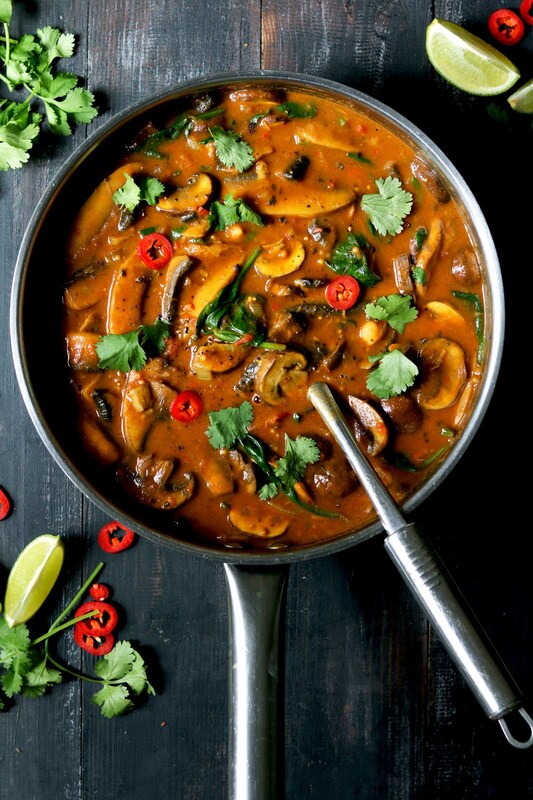 This lovely veggie mushroom curry definitely fits into that bracket! It’s also accidentally vegan and gluten-free. This mushroom curry is rich and creamy and really easy to make, perfect for a nice midweek meal. It’s mild enough that the kids will dig it too but it still has a nice little kick. You can add more or less chilli to suit your own taste. I’ve used a mixture of chestnut and portobello mushrooms for this which gives the curry more flavour and a nice meaty texture. To make this nice and creamy I used full fat coconut milk but feel free to use low fat coconut milk if you wish, but be aware it may not be as thick and creamy. The chickpeas I added for some bite and protein and spinach to get those greens in. I usually serve this with basmati rice, coriander leaves, lime wedges and extra slices of red chilli, when I’m feeling braver! Deliciously creamy and meaty this mushroom curry is perfect for a chilly Autumn evening. Heat the oil in a large sauté pan. Add the onion and cook for 5 minutes over a medium heat. The onions should be soft and golden. Add the garlic, ginger and chilli and cook for another 2 minutes. Stir in the spices and cook for 1 minutes until to can smell them. Add a splash of water if it gets too dry. Now add the mushrooms and a splash of water stir until the mushrooms are covered in the spices. Season with the salt and pepper. Pour in the can of tomatoes and add the chickpeas, stir and leave to simmer for 5 minutes. Then add the coconut milk, stir and leave to simmer gently for another 5 minutes. Add the spinach. As soon as the spinach has wilted the curry is ready. Serve immediately with basmati rice (white or brown), lime wedges and some coriander leaves. Calories are approximate and do not include rice. This curry is deliberately mild to suit children's taste buds. If you want a spicier curry then increase the curry powder to two heaped teaspoons. You could add more chilli too if you want. Holy crap that looks amazing. I crave curry as the weather turns cooler so this recipe is right up my alley this fall! Yummy! I’m having a hard time with the conversions. How many grams to cups for the mushrooms? Hi Crystal, it should convert to 3 and a half cups of whole mushrooms. We enjoyed this curry and will definitely make again. Thanks for sharing. Have made this curry twice since this comment. We really love it. Upgrading to 5 ⭐️ ⭐️ because it is so easy and so tasty. I added a few dried mushrooms and some beans to it today because I had less mushrooms. I’ve not been able to find ground fenugreek anywhere. Tried grinding it before I read that it was different. Do NOT try this at home. Waayy too tough! Anyway I use the fenugreek seeds and it tastes great so until I find the ground stuff I’ll just keep using those. Hey I just want to know what’s currypowder ? Lovely: aromatic, hearty, and satisfying. I made this curry again and somehow it was better than the first time. We love, love, love the taste and how easy it is to make. It’s definitely on our Favourites list. Thanks again Michelle. absolutely divine … everyone LOVED it. Just cooked round 2 today and since i didn’t have fenugreek and red chilli, i substituted them with cardamon and thai red chilli powder. Served it over Vietnamese rich noodles. Went even faster than the first. Thank you for this recipe.This is a keeper. Hi, look like a fabulous recipe. Do you think I could substitute the coconut milk for a plant milk as I avoid coconut products and don’t cook with double cream etc., thanks. Love your blog stumbled across it today! I made this without the fenugreek because I couldn’t find it in any stores here, but it was luscious and warming and just plain yummy. I will make this again…often.